Team Trump spent this weekend engaging in a propaganda technique called “Whataboutism” that is similar to a technique often used by young children. Whataboutism is used to deflect attention from bad behavior by claiming that other people are at fault, like “All the other kids do it!” or “It wasn’t my fault!”. I have to admit that Trump has taken this technique to a new extreme, using it like a shotgun blasting away with excuse after excuse (most of which make no sense) trying to see if any stick so they can deflect attention, any attention, away from their own bad behavior. First up was Donald Trump Senior’s lawyer, Jay Sekulow, who tried to blame the US Secret Service for the meeting between Donald Trump Jr and the Russians, saying “If this was nefarious, why’d the Secret Service allow these people in? The president had Secret Service protection at that point. That raised a question with me.” This was not an offhand comment — Sekulow hit all of the five Sunday shows with his story. This is such a flimsy excuse — basically saying “my bodyguards should have stopped me from doing anything illegal” but it is even worse than that. The Secret Service immediately pointed out that Donald Trump Jr. was not under their protection during the campaign, which is when the meeting occurred. Part two was from Trump Sr., who just before his normal Sunday golf game trotted out the now standard “What about Hillary?” excuse by tweeting “HillaryClinton can illegally get the questions to the Debate & delete 33,000 emails but my son Don is being scorned by the Fake News Media?” Yeah, like getting one question to a debate in advance is anywhere near as bad as conspiring with your country’s enemy to throw an election. Quickly followed by part three, an extra added dose of “What about Hillary?”, claiming that the Clinton campaign conspired with the Ukrainians, so they are just as bad. This is based on a meeting between DNC consultant Alexandra Chalupa and Ukrainian diplomats. But there is a huge difference between meeting with a foreign government and conspiring with them to throw an election. Chalupa was investigating whether Paul Manafort (who was also involved in the Russian meeting) had been involved in secret dealings in Ukraine with politicians who had ties to Russia. It turned out that Manafort did have undisclosed dealings and he eventually lost his job as Trump’s campaign manager. So talking to the Ukrainians was legitimate. Indeed, the information she received was publicly available, so it isn’t even collusion, unlike the Russian information, which was presented as so secret that it could only be revealed to Trump Jr. in person. It might have been reasonable if the Trump campaign had met with the Russians because there was some suggestion that Hilary Clinton had undisclosed ties to the Russians, but that isn’t the case. Nor was there any suggestion that the Ukraine was trying to influence the US election. And finally, like all “Whataboutism” even if Clinton (and Chalupa didn’t even work for the Clinton campaign) actually did conspire with the Ukrainians for some nefarious end, would that excuse the Trump campaign from conspiring with Russia to throw the election? Even in the best case, both should go to jail. Ironically, Whataboutism was extremely popular with the Soviet Union and with post-Soviet Russia. But would it surprise anyone to learn that the Trump campaign was taking lessons from the Russians? This was written by Iron Knee. Posted on Monday, July 17, 2017, at 6:35 am. Filed under Hypocrisy. Tagged Propaganda, Russians. Bookmark the permalink. Follow comments here with the RSS feed. Both comments and trackbacks are currently closed. Polls I saw this morning are showing Independents shying away from the Republican/Russian coalition put together by Trump and his family. The House of Cards is starting to look a little shaky. Maybe soon…Whoosh! they come tumbling down and we can start to make America great again! The whataboutism excuse is SAD. As you wrote, even though I’ve said that both parties should go to jail if collusion was involved, the new meaningless defence is the pot and kettle defense. And even forgetting all this, why lie about it and arent these lies alone impeachable. Using whataboutism, if clinton was impeached for lying about a BJ why not trump for selling out his country? Or are the purer than though pro-trump camp claiming that getting a BJ is worse than being a crook? If Trump goes to jail, will he still get Secret Service protection? 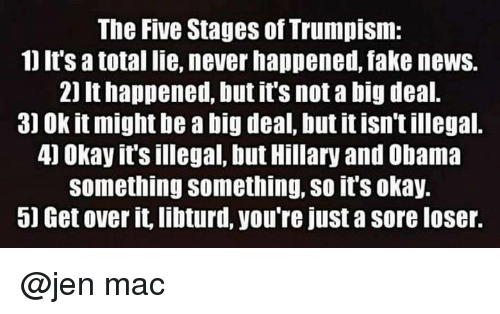 This reminds me a meme I recently came across, The Five Stages of Trumpism, any one or all five of which may come into play on a given day. For those of us (presently company included) with high hopes, even predictions, of impending impeachment of our bogus POTUS, I would just point out that in the history of the republic we have yet to carry out successful impeachment PROCEEDINGS against a sitting President. Yes, impeachment votes were cast against Nixon and Clinton, but Nixon resigned before proceedings occurred, of course, whereas Clinton (like Andrew Johnson a century earlier), was acquitted on all charges and served out his two full terms, much to the consternation of Republicans, outraged that anyone holding sacred elected office would lie about a secret affair of a sexual nature. Imagine! Well, no need to imagine. I’m talking to you, Mark Foley, Larry Craig and Dennis Hastert. Upshot being that it’s hard to imagine Trump resigning under any circumstances and would likely have to be carried out feet first in a rubber suit. But I digress. For those interested, Charles Blow, NYT columnist, was interviewed on the Charlie Rose show last week and gave a good synopsis around this, among other Trumply things. Ralph, at the very least there should be so much pressure on him to quit that republican contenders emerge. I don’t see anyone from the democrat party winning the election unlike someone pro-business like Cuban or Schultz step up. Or maybe even Jamie Dimon. Hopefully the republican voters are ashamed enough that they get someone more sensible in. I just listened to a podcast by Malcolm Gladwell interviewing someone who did undergraduate research on the correlation between playing golf by CEOs and how well their companies did. There is an inverse correlation, the more golf played, the worse their companies did. I wonder if that applies to countries? How much golf does Trump play?